How are waves created for surfing? Energie is needed so that there occurs an impulse (swell) in the ocean. This impulse is being created in wind or a storm. Wind and energy is being created through an interplay between low and high pressure systems. Through the equalizing motion of the air, wind between low and high pressure systems is created. This wind transfers energy onto the water surface and thus generates wind waves (swell). The bigger the pressure difference within a small area, the stronger the wind. And the stronger the wind, the bigger the waves will be. The normal air pressure on sea level is 1013,25 hectopascal (hpa). Everything above this standard is high-pressure and everything below is low-pressure. The isobar (lines) on a weather map indicate the pressure difference on an area, in 5 hpa steps. 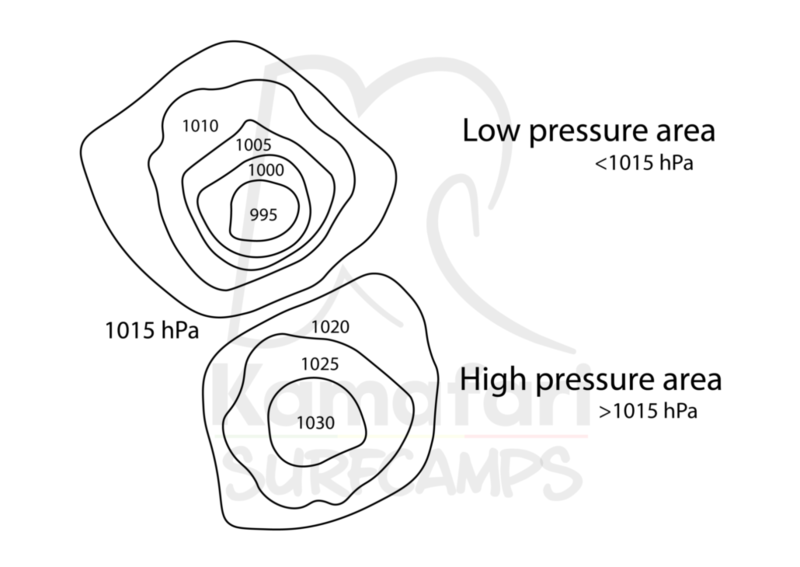 How are low and high-pressure systems generated? Warm air rises to the top and there are less air particles present. A low-pressure system is created. At some stage the air is being cooled down again in a different region, and the air particles also decrease. A high-pressure system is created. On a global scale, from south to north, prevails a interchange between low and high pressure systems. Above the warm tropics near the equator, there is so called low pressure zone. Within the middle degree of latitude, north and south of the equator, there is one high-pressure respectively. In the subpolar region again occurs a low-pressure belt and on the poles again high-pressure zones. An interchange occurs approximately all 2500 km. In a low-pressure system there are less air particles compared to a high-pressure system and therefore there occurs an equalising motion. The air particles from the high-pressure system stream into the low-pressure system, by which wind is generated. 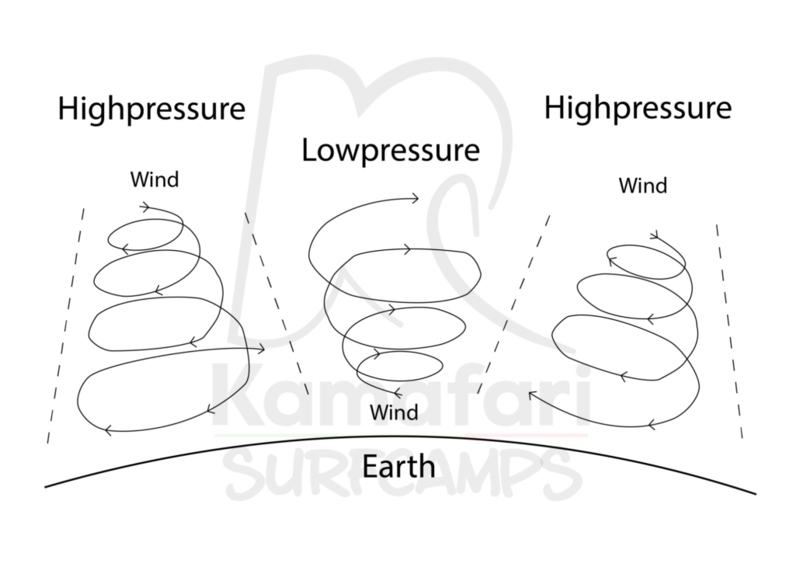 Low-pressure systems have the lowest expansion on the ground, by which the wind is strongest on the ground. High-pressure systems have the smallest expansion in high altitudes, by which the strongest air motion happens in higher altitudes. Since the earth is rotating, occurs the so called Coriolis force. This force is the cause that in the northern hemisphere low-pressure systems turn counter, and high-pressure systems clockwise. Hence the air ascends and descends like a spiral. In the southern hemisphere is it the opposite. Low-pressure systems run clockwise and high-pressure systems counterclockwise. How are unordered, wind waves turned into decent swell for surfing? The generated wind waves in a low-pressure system are quite unordered and equal a mess. As soon as these wind waves have emigrated out of the wind zone, they start to organise themselves. Here the bigger and faster ones start to connect themselves with the smaller slower ones. Hence there are developed fewer but more organised much stronger waves. When these waves travel long enough through the ocean, they organise themselves to so called wave-sets. These waves-sets consist of several waves behind each other, this can be 2-20 waves in one set. The distance or time apart from each wave is called the wave period. Clean waves sets need several days and several thousand kilometres distance to organise themselves. Between the single waves sets there occurs a distance. This is the so called ‘set break’. The longer the waves travel, the more organised and cleaner they will arrive at a coastline/surf spot. If the sets during their journey, again will hit a wind zone, then their organisation will get interrupted and they will lose energy. This can also be caused by winds near or in front of the coastline of arrival. What are the best conditions for clean and powerful waves to be generated? – outside of the low-pressure system, on their journey to a coastline, should not act upon them any more wind. 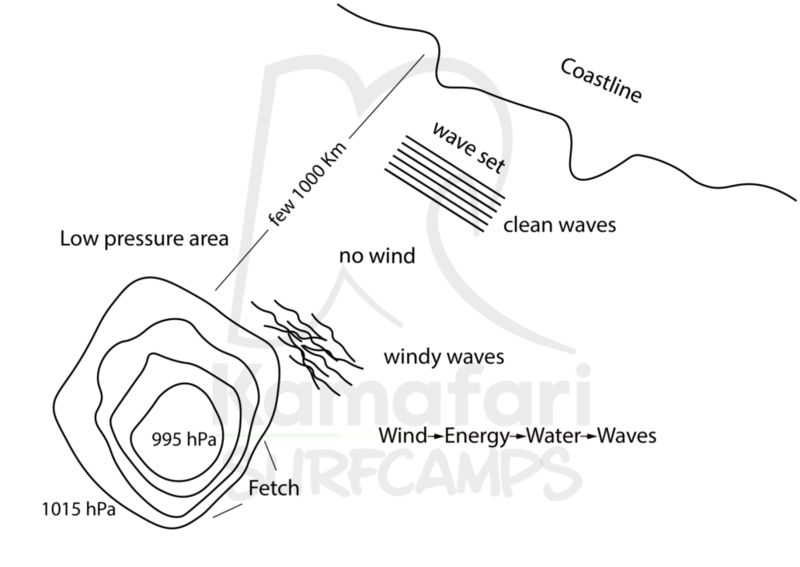 – Best surfing conditions occur when there is no or off-shore wind at the surfspot.